This month’s word was suggested by Ron over on Patreon: Greenland. He suggested it because knitting helps keep people warm and people surely need to be warm when they’re in Greenland. With that in mind, I set out to make a cable pattern, since cables keep in more warmth than lace. However, despite creating many grids from Greenland encoded in bases 6, 7, and 8, I couldn’t make a cable chart work. I was going to do a texture pattern, but nothing spoke to me. So I did a lace design after all, as you can see. It’s a lace panel surrounded by purl stitches on each side. Greenland is a multiple of 22 stitches and 10 rows. 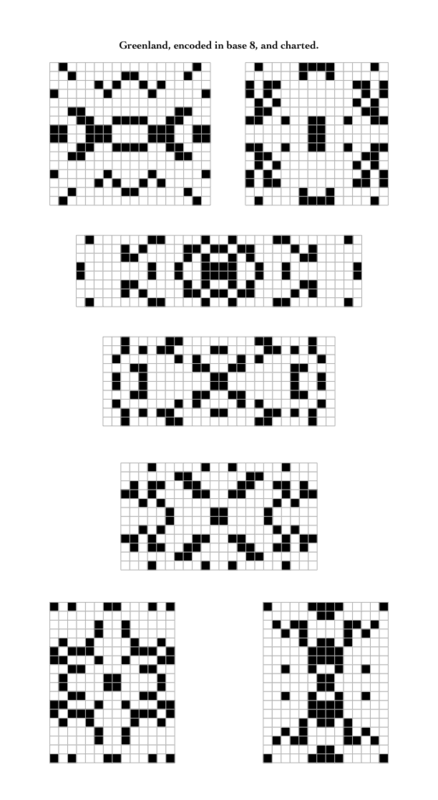 Designers, please feel free to use this stitch in your patterns. Row 1 (RS): *p1, k2, k2tog, yo, k2, ssk, yo x 2, ssk, k2tog, yo x 2, k2tog, k2, yo, ssk, k2; work from *, p1. Row 2 (WS): k1, *p7, (k1, p1) in double yo, p2, (k1, p1) in double yo, p7, k1; work from *. Row 3: *p1, k1, k2tog, yo, k1, k3tog, k2, yo, k1, yo x 2, k1, yo, k2, sssk, k1, yo, ssk, k1; work from *, p1. Row 4: k1, *p9, (k1, p1) in double yo, p9, k1; work from *. Row 5: *p1, k2tog, yo x 2, k3tog, (yo, k2tog) x 2, k1, yo x 2, k1, (ssk, yo) x 2, sssk, yo x 2, ssk; work from *, p1. Row 6: k1, *p1, [(k1, p1) in double yo, p6] x 2, (k1, p1) in double yo, p1, k1; work from *. Row 7: *p1, k1, yo, k1, (k2tog, yo) x 2, k2tog, k4, (ssk, yo) x 2, ssk, k1, yo, k1; work from *, p1. Row 8: k1, *p20, k1; work from *. Row 9: *p1, yo x 3, k2, yo, cdd, ssk x 2, k2, k2tog x 2, cdd, yo, k2, yo x 3; work from *, p1. Row 10: k1, *(p1, k1, p1) in triple yo, p14, (p1, k1, p1) in triple yo, k1; work from *. Row 1 (RS): p1, k2, k2tog, yo, k2, ssk, yo x 2, ssk, k2tog, yo x 2, k2tog, k2, yo, ssk, k2, p1. Row 2 (WS): k1, p7, k1, p3, k1, p8, k1. Row 3: p1, k1, k2tog, yo, k1, k3tog, k2, yo, k1, yo x 2, k1, yo, k2, sssk, k1, yo, ssk, k1, p1. Row 4: k1, p9, k1, p10, k1. 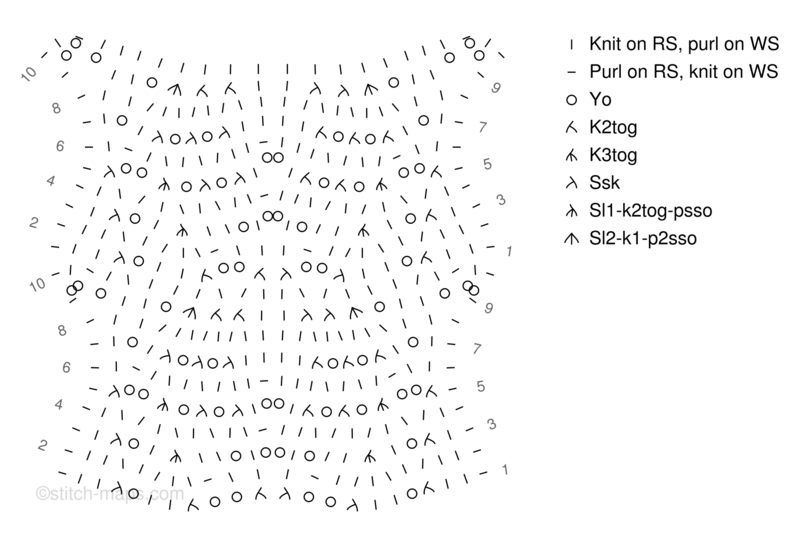 Row 5: p1, k2tog, yo x 2, k3tog, (yo, k2tog) x 2, k1, yo x 2, k1, (ssk, yo) x 2, sssk, yo x 2, ssk, p1. Row 6: k1, p1, (k1, p7) x 2, k1, p2, k1. Row 7: p1, k1, yo, k1, (k2tog, yo) x 2, k2tog, k4, (ssk, yo) x 2, ssk, k1, yo, k1, p1. Row 8: k1, p20, k1. Row 9: p1, yo x 3, k2, yo, cdd, ssk x 2, k2, k2tog x 2, cdd, yo, k2, yo x 3, p1. Row 10: k1, p1, k1, p16, k1, p1, k1. 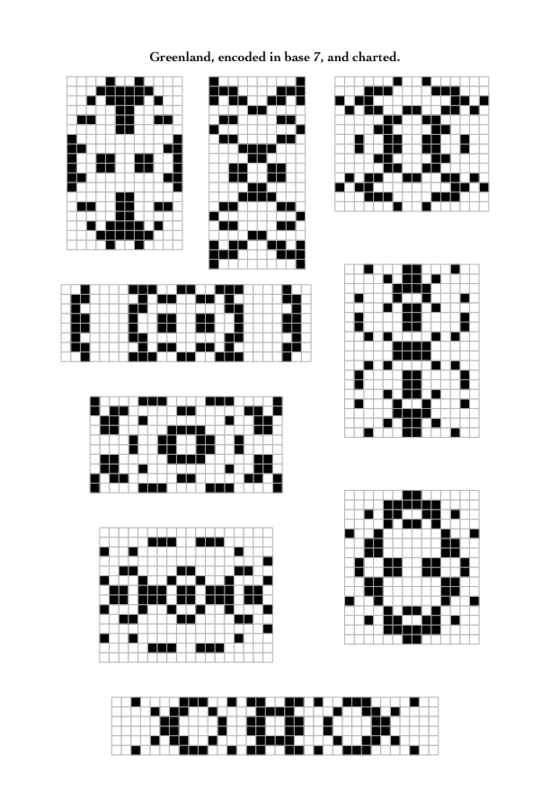 In the process of making all those grids, I noticed that lots of them were appealing in their own right. I couldn’t really pick among all the ones I liked, so here they are. Only some of these are suitable for knitted colorwork. (Look for designs with floats no longer than five stitches.) 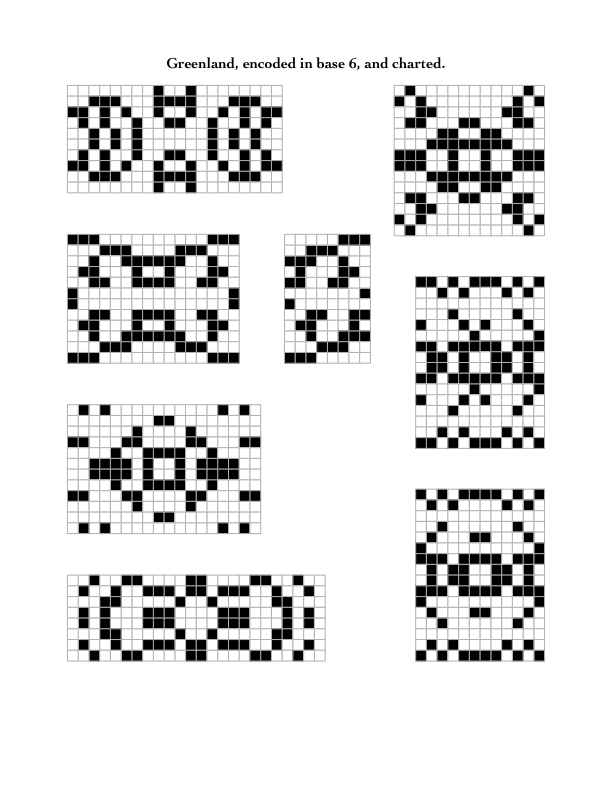 but all of them are suitable for cross stitch or beadwork or what have you. If you’d like a chance to suggest next month’s Patreon word, please subscribe at my Patreon account. Thank you for the support! Greenland patterns by Naomi Parkhurst are licensed under a Creative Commons Attribution 4.0 International License.